Is it the array of gorgeous colors? The different textures? 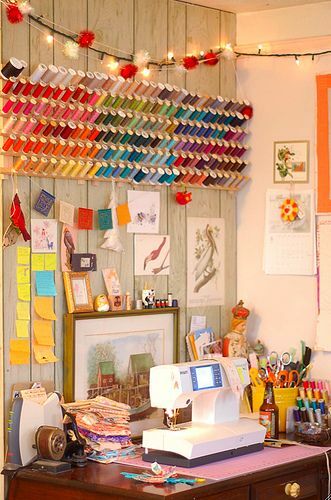 The thought of all the lovely things you could stitch? Or is it just because it’s pretty? 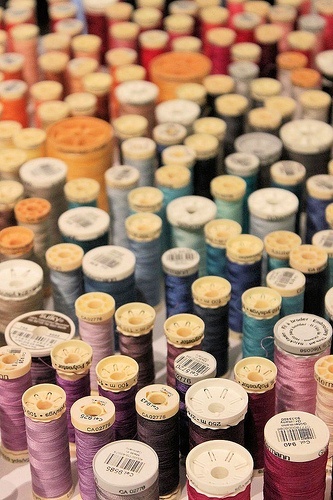 I love thread – the different types and sizes of spools, the different weights and textures of threads, and all those amazing luscious colors. I buy lots of it, some to use and some just because I couldn’t resist it’s loveliness. I have a half-dozen spools I bought in Paris several years ago, and I have the Sajou thread I bought at Purl Soho in New York City just because I loved that the spools were called “cocoons”. I use taupe, white and gray. Cones. But it still makes me happy to have pretty thread. 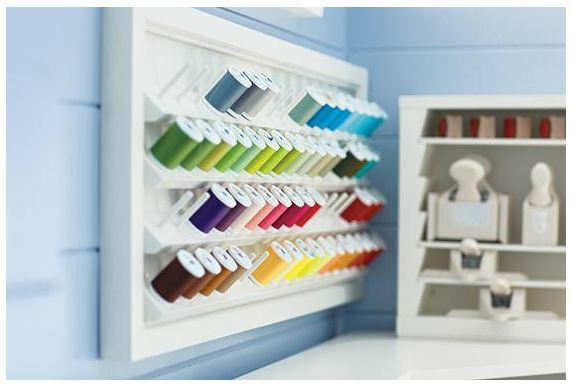 I’m pretty sure I’m not alone, most of us can’t resist buying extra spools to have some extra on hand, and maybe even because we love the pretty pictures of thread storage ideas we see on Pinterest and Google Images. From Pinterest – no link to original source. From Pinterest – no link to original. 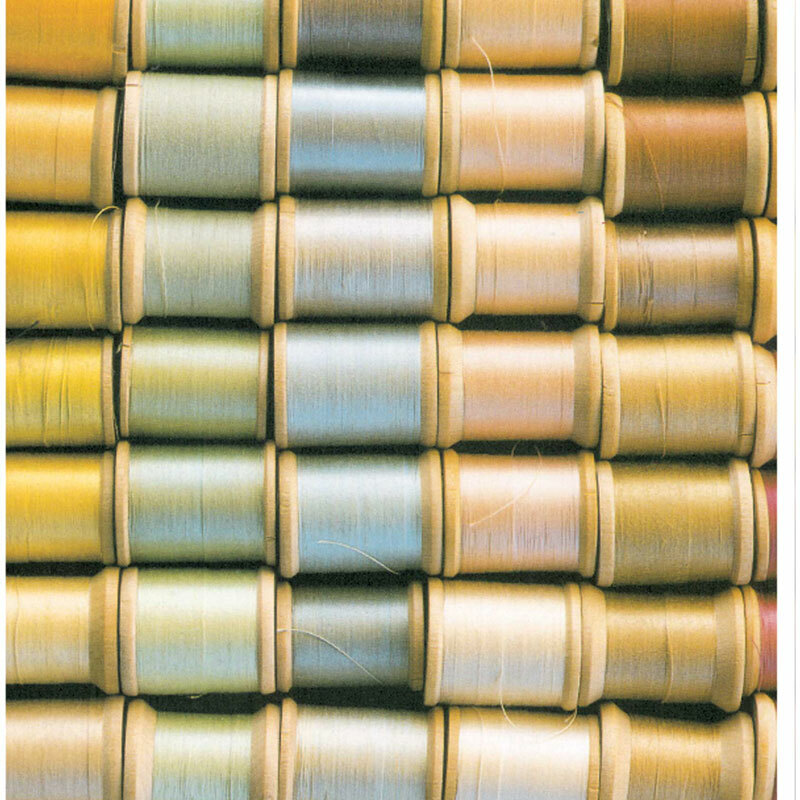 Here’s the problem – unless you’re using these threads regularly, this isn’t how thread should be stored. “Using regularly” – that’s the key phrase. If you do a lot of decorative stitching and/or machine quilting, having a large variety of thread colors, weights and finishes is what you use. Keeping it on hand, easily visible and accessed is a good idea. But if you don’t use it all the time, if you sew in a bright, sunny room that gets really warm in the afternoon and you’re next to a river, ocean or lake… maybe not. Okay, that was kind of stacking the deck in my favor. The issue is simple – thread does “go bad”. It becomes brittle, weakened, stressed and a dozen other things that will cause it to deteriorate. While all thread eventually weakens and deteriorates eventually – think decades and centuries – the reason we should think about it now is that we’re using it to sew. Now. When it breaks or knots, that’s frustrating. If that’s happening because of deterioration, it’s something we can avoid. And no, it shouldn’t be stored in the freezer because it slowly removes the moisture. No one is quite sure where that idea came about but it’s possible it came from the textile museum practice of putting quilts in the freezer. And why do they do that? The International Quilt Study Center puts quilts in the freezer for 24 hours to kill any critters that might be inhabiting them. I have to confess that I learned some of this when I took Singer Sewing classes back in the 1970s, and I picked up more along the way from classes, books and personal experience. Good machine-quilters have been a great source of information because they use thread in what can only be called “extreme conditions” – their needles are traveling at a very high rate of speed. And they use a lot of thread. So what I know is this – the principal enemies of thread (and fabric) are light, variations in temperature & humidity and dust. Direct sunlight is the most obvious but storing thread close to a lamp or other light will eventually create the same problems – fading and drying. 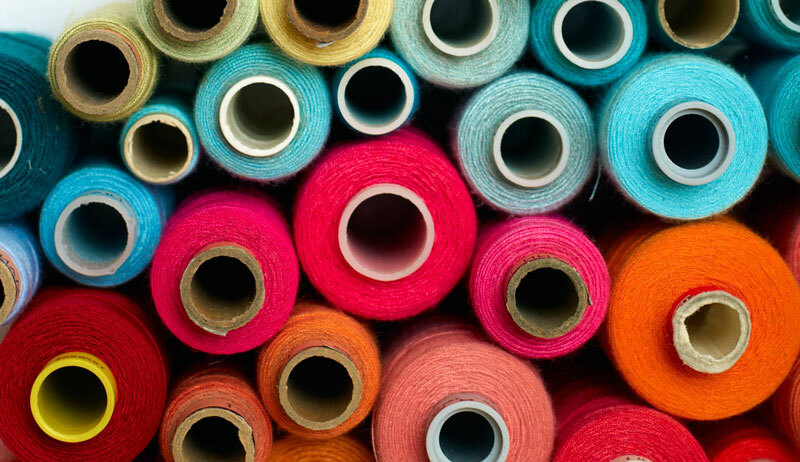 To maintain it’s optimum strength, threads need to retain a degree of moisture, a balance. Anything that increases or decreases that will cause it to deteriorate – the more extreme the exposure, the faster the deterioration. Whew. The other issue is dust. I saw it described once as being like microscopic little knives “cutting through the fibers”. Well. Okay. But really, it’s more than that. If you’ve ever read anything about dust, you don’t want to know the rest. Basically, dust is bad for all sorts of reasons. It’s not only harmful to you, it’s incredibly harmful to textiles because of what dust actually comprises. Again, you don’t really want to know. 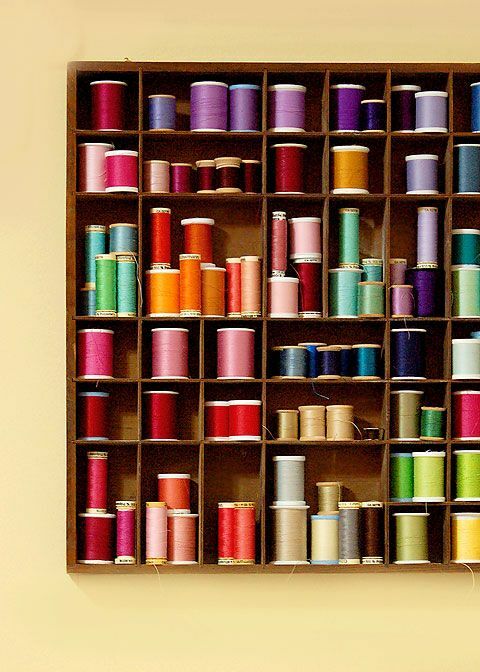 So storing your thread in the open where it will be exposed to regular, ordinary household dust should be avoided. A plastic storage box designed for thread turns out to be the best kind of storage – so long as you don’t then store the box in direct sunlight or next to a heat lamp. Artbin makes one called the Super Satchel and Slimline calls theirs a Spool Storage box. Any kind of box or container will also work so long as it protects the thread from dust, minimizes exposure to light, humidity and temperature variations, and keeps the spools separated and the threads from tangling is recommended. For more information about threads and storage, I found two terrific articles while double-checking some of my information. And that’s it about thread for today. I’ll be back tomorrow to chat about something else. Next Next post: Spin. Collapse. Pop. Great article. I really enjoy your blog. I store my thread in a Sulky universal spool container from Jo-Ann’s, so it’s nice to know I’m doing the right thing. But I have a bunch of thread that’s too old to use, yet I couldn’t throw it away, and I have a type drawer, so you have given me a great idea. Have a fun time at your retreat! Great blog post! 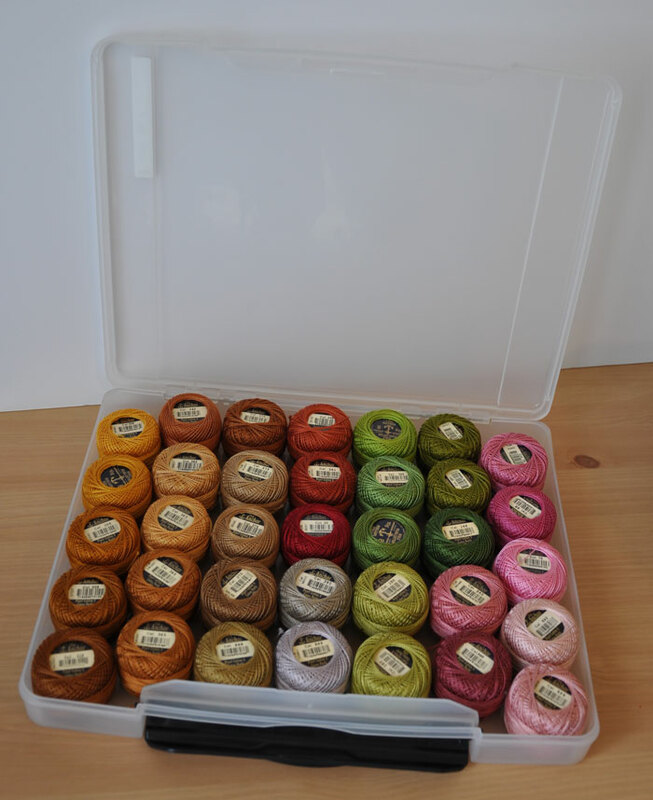 I have to go move my thread now….from the display rack to some containers! Thanks for all the useful information you pass on in your blog. I am really enjoying every post. For some unknown reason, I started storing my thread in a couple of air tight tins about 50 years ago. 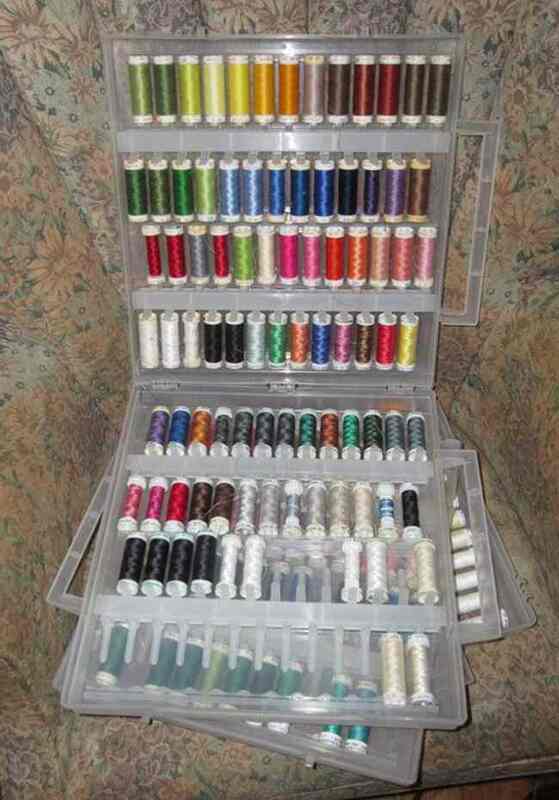 Over the years, I did general household sewing, so a couple of tins worked out just fine for thread storage. It wasn’t until I started quilting a couple of years ago that I found out that thread can degrade. However, I can report that I do have some thread on wooden spools that are still okay. Now that I am doing so much piecing and quilting, I have purchased a lot of new threads. My thread storage solution, like one of yours, was to get Art Bin boxes with dividers. In the divided areas, I store each spool along with any bobbins with matching thread. I really do not like having to guess what thread is on a bobbin so that is why I keep thread and bobbins together. Obviously, I don’t have huge numbers of spools of thread, but this is working for me now. Thanks Carrie for another interesting and informative on an object that is an important part of our sewing endeavors. You’ve mentioned you use aurifil on cones. Where can we purchase this product? Great article. Thanks Carrie! Happy Thursday to you! The thread looks so pretty when it’s out on display. But knowing that it gets “old” , I just keep the minimum on hand and buy as I need it. Thanks for the great info and storage ideas. Thanks for the info, articles, links and pictures! I find that if I have a thread that is giving me issues, like fuzzing, etc., I put it in the freezer. Yeah, DH, wanted to know when I was going to spring that meal on him! 🙂 But it does help. Because in reality you don’t know how long that thread has been sitting on the shelf. So freeze it! The Threads article was extremely helpful and informative. I am sharing it with my fiber arts/quilting buddies. I really appreciate the technical info and tips! I found some great bins at WalMart years ago. They are in the toy section used to store Hot Wheels! And just by luck I store them in the closet so they are in the dark and dust free. I almost waive red looking at the cute colors on the wall display, so glad I didn’t! Great information, Carrie. Thank you. This information is timely for me because we’ve a new, large, beautiful craft studio & are busy placing the Beading projects, Embroidery, Carving, & Quilting for each of us to have everything at hand. We are so lucky!! I wanted to add that in 1975 my daughter lost a button from a pair of Army Green pants; the button was prominent & although we looked everywhere we could not find that shade of green. Our neighbor thought he might have it & brought out his ARMY sewing kit & there it was. He was one of the first to fight in WWII so it was ooollldd. We used it for the button & returned it but John wanted us to keep it. I used it in machine embroidery, hand embroidery & yes in quilting. I finally used it up to my regret but kept the spool labeled, “Made in Danville, VA. for the US ARMY” but no date. Why was this thread still good?